There’s a push to add an intelligence/aptitude test to the mix for university admissions. It’s an indirect and stupid way to solve the problem of the homogeneity of university intakes. I’m a product of the Equivalent National Tertiary Entrance Ranking system. If not for the ENTER, I would never have gone to study economics at uni, never worked at Treasury, never gotten fed up with the public service and never started this blog. The amount that hinges on the ENTER meant I took it seriously. Because there was no other way to get into university, and I had no idea what else I could do, I worked hard in year 12. I have never worked so hard before or since. This, no doubt, was good for me. However, I went to a posh school, and there’s no doubt that in another environment, I would have scored lower. Not because the instruction was particularly good, but because the kids there were all competing. Enter wasn’t just something the school or teachers wanted for us. It was something we wanted for ourselves. Melbourne Uni is full of people with good ENTERs. It is also full of people who went to posh schools. If I recall correctly, about 40 percent of my graduating class went there. Meanwhile, most public high schools sent at most a handful of graduates there. Some of the difference is explained by the fact that my high school was selective entry. Some is explained by parental expectations. The sort of parents that expect their kids to go to uni may also make huge sacrifices to send them to an expensive school. But a large portion of the difference is explained by private schools doing a lot, in a lot of ways, to help kids get better ENTERs. 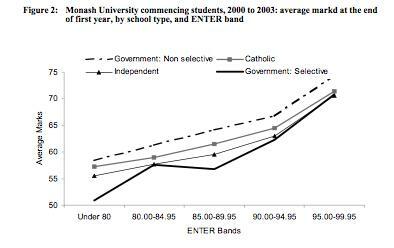 Miller and Birch (2005) and Dobson and Skuja (2002) show that on average, students who attended non-selective public schools have gone on to outperform students who earned the same ENTER at Catholic, Independent and Government selective schools. Their first year marks are four points higher. If ENTER is intended to predict university performance it is failing in a systematic fashion. If the under-representation of the publicly high-schooled could be rectified by diminishing the importance of the ENTER, that could be good for enhancing diversity of the student base, and for meritocratic justice being served. However, the IQ-style SAT test is not necessarily the answer. It is increasingly understood that IQ measures a fluid ability. If the brain is a muscle, IQ is its ability to lift. Under the right training (i.e. changing the environmental stimuli), IQ can improve by up to 20 points, as this Time Magazine article from 1938 argues, and this somewhat more up-to-date paper confirms. I bet private schools would prove just as good at tweaking their students SAT scores as their ENTERs. “If the everyday world is your cognitive home, it is not natural to detach abstractions and logic and the hypothetical from their concrete referents,” Flynn writes. Our great-grandparents may have been perfectly intelligent. But they would have done poorly on I.Q. tests because they did not participate in the twentieth century’s great cognitive revolution, in which we learned to sort experience according to a new set of abstract categories. In Flynn’s phrase, we have now had to put on “scientific spectacles,” which enable us to make sense of the questions about similarities. To say that Dutch I.Q. scores rose substantially between 1952 and 1982 was another way of saying that the Netherlands in 1982 was, in at least certain respects, much more cognitively demanding than the Netherlands in 1952. An I.Q., in other words, measures not so much how smart we are as how modern we are. If we want undergraduate populations to reflect the diverse populations of people that have the best chance of success, rather than the narrow slice they currently consist of, another way must be found. Miller and Birch suggest adding points to the ENTER of a Government school graduate. Would this work? Or would Government school enrolments simply be swelled in year 12 by students crossing at the last minute to obtain the benefit? Would the benefit of year 12 be lost if an aptitude test could substitute for the hard yards? What do you think? The “benefit” of year 12? I too have never worked so hard, before or since (not even for APSI levels!) and yet that’s the point: uni was a definite step down in intensity, many a job even more so. Year 12 only measures your ability to meet deadlines with massive truckloads of work and pressure, or perish, a situation that isn’t reflective of the world around you, or a measure of your ability to cope in it. 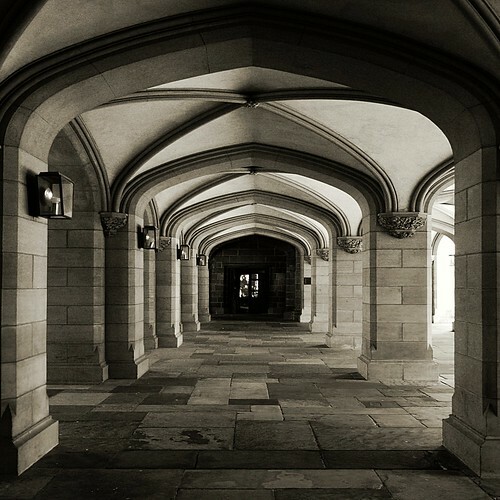 University entry is difficult, perhaps entry needs to be placed in the hands of the institutions, not ‘standardised’, to allow some kind of ‘fit for purpose’ entrance (like Medicine did a while back, cutting off the ENTER requirement at 96-odd, and using interviews and things for selection)? While I don’t understand the Australian context, I really like this post. I’ve been changing kids lives by helping them to improve their SAT scores for while now, so I wanted to weigh in on this discussion. The statistical correlation is meaningful only if one wants to argue about “fairness” or some sort of hypothetical level playing field. In actuality, income level correlates to many things, one being the ability to pay for an SAT coach or other SAT prep, that in turn correlate with higher SAT scores. What really correlates to higher SAT scores is preparation, with skilled preparation that comes from coaching having the greatest impact. In this regard, the SAT is no different than anything else. Coaching and preparation helps everything: athletic ability, acting, playing music, public speaking, climbing up the corporate ladder (it’s usually called mentoring in that context), etc. When you prepare, put in the hours of practice, at anything, you get better. When you get skilled coaching, you get better faster. Just so I’m clear, I’m saying that a student who puts in the time to prepare for the SAT “gets better” at what the SAT measures, which includes “test taking” but also includes math, critical reading ability, writing, grammar, critical thinking ability, problem solving skills, analytical reasoning, the ability to manage one’s emotions, and the level of focus needed for the task. In addition to all of that, a student who puts in the continuous effort over time has the opportunity to “get better” at the inner game mental and emotional skills that are necessary to keep practicing an activity that doesn’t necessarily feel good in the moment (other such examples are dieting and exercise). All of the aforementioned skills are arguably more important to life than learning the content of a high school chemistry or french class. Finally, let me say that the fact that relatively short term preparation (say 3 to 4 months) for the SAT can have such significant impact on a student’s performance and ability in these areas is much more an indictment of the quality of education that most Americans receive in high school than it is an invalidation of an SAT score or the preparation required to improve it. 12/12 on the writing task. Seriously though, thanks for your comments – the perspective that working on the SAT is a way of working on one’s cognitive skills is a logical extension of the idea that it can be studied for. I should have thought of that! Interesting points, which are not contrary to the questions raised, because even though kids’ SAT scores (plus whatever other skills) are going up, there is not evidence that their later performance is improving (at least not their performance at university). The point of the level playing field in a selection context is that if some kids are coached and some aren’t, the test loses its predictive ability. The study you reference is referring to the WISC- the Wexchler Intelligence Scale For Children, and yet, you and the study, seem to be talking about adults. I’m confused by the lack of congruence. Previous Previous post: should i run through the rain? Next Next post: NFL, AFL, cycling and helmets.